Daniel Green was first home for the club in the Deal Dinosaur 10k on Sunday, finishing in 9th place and 3rd MV40 in a time of 38m:39s, followed in by Robert Barton in 25th place in 41m:49s, Adrian Moody 49th in 45m:30s and Claire Green in 51m:37s. At the latest Ashford Summer series 5k race, the club took the top 3 places, with Dan Green finishing 1st in a time of 18m:36s, ahead of Robert Barton making his debut for the club in 2nd place in 19m:04s and Ryan Edwards in 3rd place in 19m:10s. Mark Carlton ran a personal best as he finished in 10th in 22m:13s and Becky Hodgson 23rd in 31m:28s. 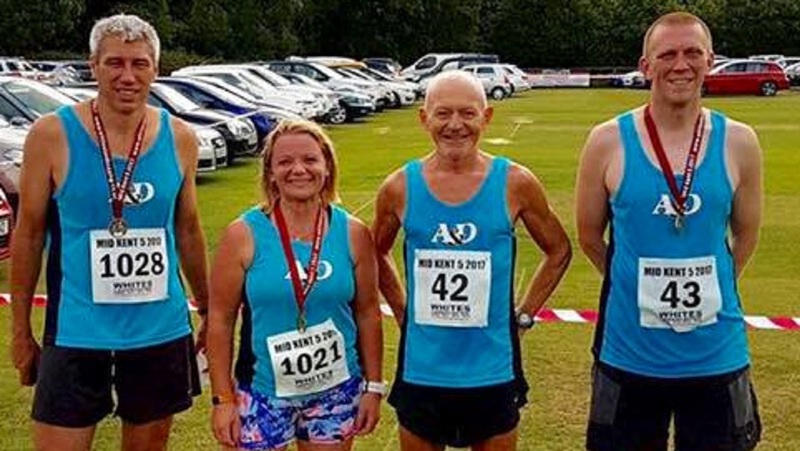 On a flat fast course around the course in Staplehurst, the club had some excellent performances, with Robin Butler first home for the club in a superb time of 30m:45s, placing him 17th overall and 2nd MV45. Kevan James was 37th overall and 5th MV55 in 33m:45s, Stu Nunn ran a personal best with his 49th place finish in 35m:56s and Ingvild Drake was 84th in 40m:00s.